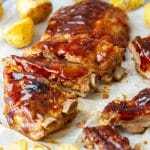 Instant Pot Hoisin Ribs are cooked in a pressure cooker and glazed with hoisin sauce. Tender, fall-off-the-bone ribs are ready on your table in under an hour! In a small bowl, combine all the dry rub ingredients. Rub this over the ribs (both sides). Pour 1½ cup of water into the inner pot of Instant Pot. Insert the steam rack and place the ribs onto it. Hoisin sauce: Combine all the ingredients in a bowl. Pour half of the sauce into a sauce pan and set it aside. Brush the remaining sauce over the ribs. When done, cover the pot with lid and lock it in its place. Turn the steam valve to SEALING. Press MANUAL (pressure cooking) and adjust the time to 25 minutes. When the time is up, wait 10 minutes before releasing the pressure manually. Heat up the hoisin sauce that you have previously set aside. Simmer it for about 5 minutes, stirring occasionally. Option 1: Pour the sauce over the cooked ribs, cut them and serve. Option 2: For crispy ribs you can place them on a grill or under a broiler. I like using small electric panini grill maker. It’s a quick way to get the crispy look. For oven and broiler you can pour the sauce over the ribs before putting them in. For the panini maker pour the sauce over after you take them out. The overall time does not include time needed for the pot to come to its pressure (about 10 minutes) and time needed to release its pressure (another 10 minutes). Soy sauce can be substituted with Worcestershire sauce. Paprika – I used regular (sweet) paprika but you can also use smoked one.